Info "Handing out flyers really stinks sometimes. It's way easier when people meet you halfway and stick their hands out." Frequent Flyer is one of Kat and Ana’s Microgames in WarioWare: Smooth Moves. 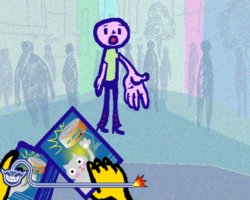 The player must hand out a flyer to a person. 1st level difficulty: The recipient is standing still. 2nd level difficulty: The recipient is walking. 3rd level difficulty: The recipient is running. This page was last edited on February 19, 2018, at 17:50.